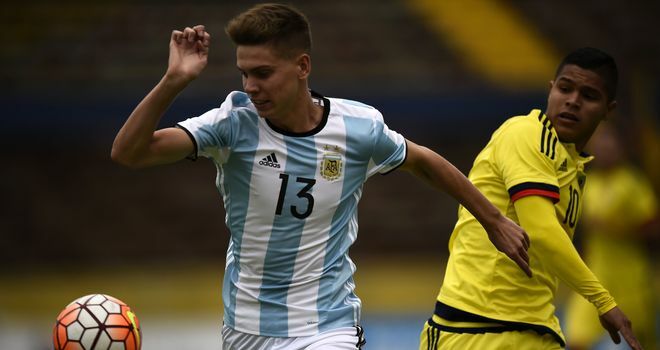 Tottenham have agreed a deal with Estudiantes for Argentina U20 defender Juan Foyth, Sky Sports News understands. Spurs boss Mauricio Pochettino has been targeting Foyth for much of the summer although, for a while, it appeared the move was dead because of the Argentinian side's valuation of the player. Pochettino decided to withdraw from talks after Estudiantes chief Juan Sebastian Veron - who played with Pochettino for Argentina - demanded more money for the 19-year-old. Foyth is rated one of the most talented young defenders in world football and Spurs' move for him had also been complicated by interest from big-spending Ligue 1 side Paris Saint-Germain. But it would appear the ball-playing defender has instead chosen to come to the Premier League after speaking with Pochettino - he would become their second summer signing after Ajax's Davinson Sanchez. Speaking to Argentinian newspaper El Dia, Foyth is quoted as saying: "It's a club that bets on the young and I think I'm going to have a chance to play. "I also spoke with Mauricio Pochettino and I liked what he said. It was what helped me decide that Tottenham was the right place to continue my career. "He told me to go, train and that I would be involved I would play. He also told me what the club was like, what job idea it had." Liverpool could conceivably end the season with 97 points having lost only one game and yet fail to end their 29-year wait for the league title.